Softcover, 8 1/4 in. by 11 1/2 in. 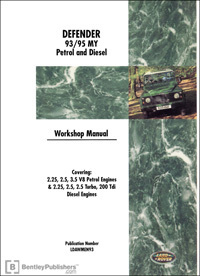 The Land Rover Defender Official Workshop Manual: 1993-1995 is an invaluable guide to the efficient repair and maintenance of your 1993-1995 Defender. In addition to comprehensive sections detailing maintenance, engine specs and electrical systems, highly detailed illustrations and instructions on everything from engine maintenance to chassis and body repair make this manual a must-have for the Defender owner and driver.